Constellation design has been previously addressed by assuming that there is a linear equalizer at the receiver side. However, the widely linear equalizer is well known to outperform the linear one with no significant complexity increase; we derive optimum and suboptimum techniques for constellation design in presence of such an equalizer. The proposed techniques adapt the circularity properties of the transmitted signals to the specific channel to be equalized; their performance analysis shows that also the simplest suboptimum procedure provides significant improvements over a fixed-constellation scheme. Constellation design has been previously addressed by assuming that there is a linear equalizer at the receiver side. 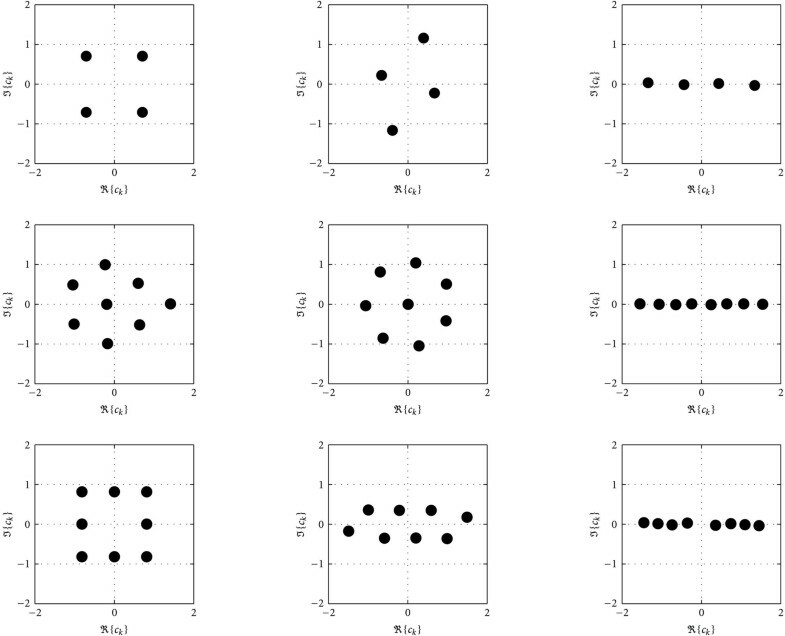 In early works (see, e.g., [1, 2]), the optimization of a two-dimensional constellation in order to minimize the symbol error rate (SER) was first addressed with reference to the transmission over a nondispersive channel affected by additive noise. The advantage provided by the constellations with two degrees of freedom (such as quadrature amplitude modulation (QAM)) over the ones with one degree of freedom (such as phase-shift-keying (PSK), and pulse amplitude modulation (PAM)) was shown , and a proper mapping (based on a gradient-descent procedure) of the information bits into points of a two-dimensional constellation was proposed . However, the adoption of an additive-noise nondispersive channel model allows one to consider the constellation mapping independently of the equivalent channel. On the other hand, an amount of literature (e.g., [3–7]) refers to the optimization of the transmitter and/or the receiver without including the choice of the constellation in the optimization procedure. In fact, many existing transceiver processing techniques are optimized (according to a chosen criterion) by only exploiting knowledge of the statistics of the information symbol sequence. This paper addresses the constellation design under the assumption that the transmitter is fixed (i.e., by considering an equivalent channel representing the transmitter and the channel) and a widely linear (WL) minimum mean square error (MMSE) equalizer is employed at the receiver side [8–14]. The WL filtering generalizes the conventional linear filtering and allows one to achieve a power reduction of the additive noise and interferences at the equalizer output, and therefore a performance gain, by exploiting the statistical redundancy possibly exhibited by a rotationally variant transmitted (and/or received) signal. For such a reason, the adoption of the WL equalization has frequently been confined to the transmission of one-dimensional constellations (see, e.g., [3, 15–17] and references therein) since the advantage of using the WL filtering (instead of the linear one) is maximum for one-dimensional constellation. Two-dimensional constellations (especially high-order ones) are often preferred to one-dimensional constellations (in presence of a linear receiver) in order to maximize the minimum distance between the constellation points . However, WL linear filtering provides no performance advantage over linear one when the chosen constellation and the additive noise are circularly symmetric. For such a reason, we consider the optimization both over circularly symmetric and over rotationally variant constellations without any assumption about the circularity properties of the additive noise. In fact, the noncircularity of the constellation is introduced in order to exploit the presence of the WL receiver but it also provides a disadvantage in terms of the minimum distance between the constellation points. When both the effects are accounted for, the optimum degree of noncircularity of the constellation becomes dependent on the specific channel impulse response. Therefore, we address the constellation design under the assumption that the channel state information (CSI) is available and we propose a CSI-dependent symbol mapping that optimizes the performance of the WL MMSE receiver. Symbol mapping is adapted by using a feedback channel (between the receiver and the transmitter) carrying information about the optimum constellation. 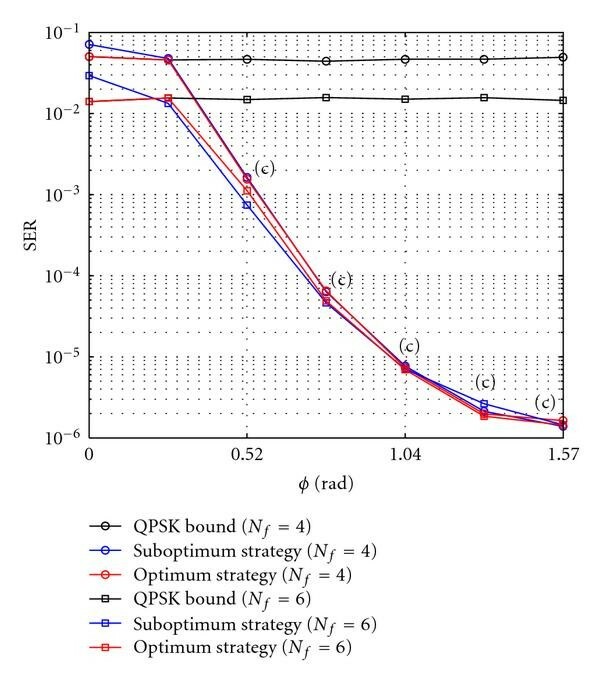 Moreover, suboptimum strategies are proposed in order to reduce both the amount of information to be transmitted on the feedback channel and the computational complexity of the optimization procedure. The paper is organized as follows. Section 2 introduces the system model, recalls the MMSE equalizer structure and analyzes how its performance depends on the amount of pseudocorrelation of the transmitted signal. Section 3 addresses the constellation design in the presence of the WL MMSE equalizer by generalizing the results in  to the case where the additive disturbance (noise plus interference) is rotationally variant. Section 4 reports the results of simulation experiments mainly aimed at showing the performance advantages provided by the constellation adaptation procedures. Finally, Section 5 provides the conclusions and the final remarks. The following notations are adopted throughout the paper. is the imaginary unit, the superscripts , , and denote the complex-conjugate, the transpose and the Hermitian transpose, respectively, is the statistical expectation, is the Kronecker delta, is the identity matrix of size , is the vector/matrix with all zero entries (the size is omitted for brevity), denotes the th entry of the vector , denotes the entry of the matrix , denotes the th column of , and are the real and the imaginary part, respectively, denotes the -norm with , and, finally, is the -transform of . In this section, we introduce the considered system model; then, we derive the WL MMSE feedforward-based equalizer and we study the variations of the achieved MMSE versus the pseudocorrelation of the transmitted signal. Such an analysis will be useful in Section 3 to address the constellation design for MMSE receivers. where the transmitted symbols are independent identically distributed (i.i.d.) zero-mean random variables drawn from the complex-valued constellation whose (finite) order determines the bit rate ( bits per symbol) of the uncoded system part. With no loss of generality, we assume that and , that is, the transmitted available power is unit, and that exhibits a possibly nonnull pseudocorrelation , such that (if , then the correlation matrix of the random vector will be positive semidefinite); note that the noncircularity of consists in the difference between the power of the in-phase component and the quadrature one and in the correlation between them. Such assumption allows one to consider both the conventional circularly symmetric constellations ( ), such as -PSK and square -QAM with , and the rotationally variant constellations, such as the well-known PAM ( ) and its rotated version (for which it exists such that is real-valued and, consequently, ), non-square QAM (with since a different power is allocated to the in-phase and quadrature components). The time-invariant FIR channel impulse response of memory is assumed to be known at the receiver side. Finally, the additive noise , whose power is assumed known at the receiver, is modeled as zero-mean complex-valued wide-sense stationary time-uncorrelated and independent of the useful signal. The additive disturbance is not assumed circularly symmetric because it may include the effects of one-dimensional cochannel interferences. where is the (possibly) nonnull noise pseudocorrelation (if , then the noise is circularly symmetric). where denotes the th column of and the processing delay has to be chosen in order to optimize the performance. For notational simplicity, in (4) and (5) we have omitted the dependence of and on . Let us point out that when , that is, the transmitted symbols are drawn from a circularly symmetric constellation, = 0 and, therefore, the WL MMSE equalizer degenerates into the conventional linear MMSE equalizer. Another special case is represented by the scenario where a real-valued constellation is adopted. In fact, since , and the WL MMSE equalizer becomes , that is, it is implemented by extracting the in-phase component of the linear equalizer , which does not coincide, however, with the linear MMSE equalizer. Since and are positive semidefinite, one has and, hence, increasing the degree of noncircularity of the transmitted signal improves the MMSE. For such a reason, the use of a real-valued transmitted sequence together with a WL MMSE equalizer corresponds to the optimum choice as far as the MMSE is adopted as the performance measure. On the other hand, when , the variations of with respect to depend on the specific values of the channel impulse response and the noise statistics. The present section addresses the design of the -order constellation with fixed (under the assumption that the WL MMSE equalizer is used) and it is organized as follows. In Section 3.1, we address the optimum constellation design for the WL MMSE receiver by extending the results of  to the case of additive rotationally variant disturbance. In Section 3.2, we propose a suboptimum strategy based on the rhombic transformation of a given constellation. Such a strategy allows one to reduce both the computational complexity of the optimization procedure and the amount of information required at the transmitting side in order to adapt the constellation. The results in the previous section allow one to state that, by using a real-valued constellation ( ) instead of a complex-valued nonredundant ( ) one, a performance gain can be achieved in terms of the MMSE at the equalizer output. On the other hand, not always an MSE gain provided by the WL equalizer leads to a SER gain . In fact, for a fixed expended average energy per bit, the reduction of the minimum distance between the constellation points, due to the adoption of one-dimensional constellations rather than two-dimensional ones (e.g., when we adopt the -PAM rather than the -QAM) leads to a potential increase in the SER. Therefore, we address the constellation design minimizing the SER at the WL MMSE equalizer output by accounting for its rotationally variant properties. In the literature (e.g., [2, 20]), most of the constellations employed by the transmission stage are circularly symmetric ( ), while statistically redundant constellations are confined to the real-valued ones. 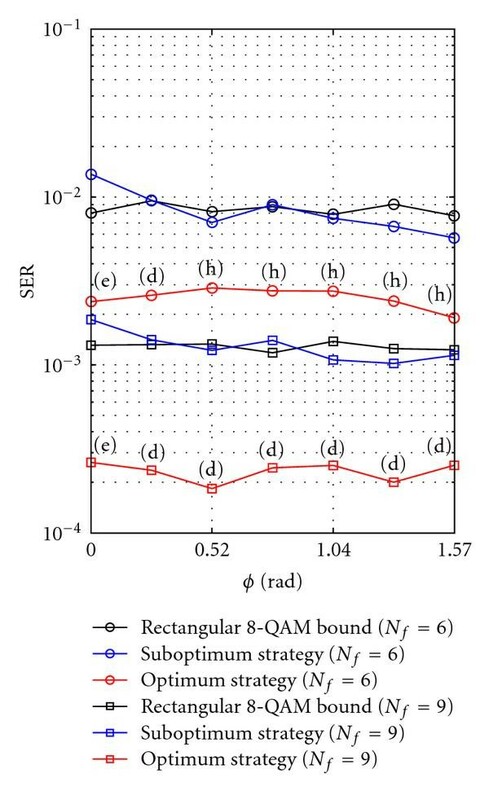 Moreover, in , with reference to the transmission over a time nondispersive channel ( ) affected by circularly symmetric noise, a procedure for constellation optimization has been proposed, showing also that, for large signal-to-noise ratios (SNR), the performance of the conventional QAM maximum-likelihood (ML) receiver is invariant with respect to rhombic transformations of the complex plane. However, it is important to point out that a rhombic transformation of a circular constellation makes it rotationally variant and, for some values of (e.g., ), the procedure in  provides a rotationally variant constellation. On the other hand, the WL equalizer is equivalent to the linear equalizer over the nondispersive channel considered in  and, therefore, optimizing the circularity degree of the constellation does not provide any performance advantage. On the other hand, when a time-dispersive channel is considered, the WL MMSE equalizer is sensitive to the rotationally variant properties of the transmitted signal and, therefore, we propose a transceiver structure (see Figure 1) where (i) the transmitter can switch between the available constellations of order ; (ii) the WL MMSE receiver accounts for the CSI and informs the transmitter, by means of a feedback channel, about which constellation has to be adopted to minimize the SER. The use of a feedback channel in order to improve the bit-rate could also be exploited for choosing the constellation size rather than its circularity degree when the signal-to-noise ratio of each channel realization is not previously known. For example, the problem of the constellation choice has been addressed in [21, 22] with reference to the discrete multitone (DMT) transceiver and to multiple-input multiple-output transceiver, respectively. The two parameters of the constellations (size and circularity-degree) could also be jointly optimized by generalizing the procedures here proposed. In order to optimize over the constellation choice we need to first derive a performance analysis of the considered equalizer. Approximated evaluations of the performance of the WL receiver are available in  for a QAM constellation and in  for a PAM constellation in the presence of a PAM cochannel interference. Moreover, such performance analysis is generalized in  for IIR WL filters. Here, we derive an approximation of the equalizer performance suited for successive optimization over transmitter constellation. where is the transmitted symbol drawn from the complex-valued constellation with and , and is the residual disturbance that includes the intersymbol interference and the noise terms after the WL equalizer filtering. The circularly symmetric model for the additive disturbance is inadequate since the output of a WL filter is, in general, rotationally variant. Therefore, we model as rotationally variant, that is, , , and . Moreover, in order to make the constellation design analytically tractable, we approximate as Gaussian. For the sake of clarity, let us note that, if symbols and noise are circularly symmetric ( ), then the additive disturbance and the equalizer output will be circularly symmetric too; on the other hand, if is rotationally variant, then will be rotationally variant too, but nothing can be stated about the circularity properties of also when . Unfortunately, it is difficult to find the closed-form expression of the solution of such an optimization problem. For such a reason, we propose to find a local solution by means of numerical algorithms (e.g., a projected gradient method). To this aim, we can exploit the gradient of with respect to , while we resort to numerical approximation of the gradient with respect to since it is difficult to obtain its analytical expression. Condition (17) generalizes the result of  to the case of rotationally variant (i.e., or ) and with a constrained pseudocorrelation. ( .) In fact, (17) with (i.e., no constraint is imposed on the pseudocorrelation) requires that is proportional to the weighted sum (with weights ) of , , as found in . For the sake of clarity, let us note that the procedure proposed in  does not allow one to exploit the potential advantage of a rotationally variant constellation when the WL MMSE receiver is employed. For example, when a linear MMSE equalizer is employed for in high signal-to-noise ratio, the minimum of the SER is equivalently achieved  by both the conventional 4-QAM constellation and the rhombic constellations with the same perimeter, that is, the perimeter of the largest convex polygon consisting of the lines (see  for further details). On the other hand, when a WL MMSE equalizer is employed, a rhombic constellation, which is rotationally variant, is not equivalent to the conventional 4-QAM since the achieved MMSE is dependent on as shown in (8). In this section, we propose a suboptimum constellation-design procedure for the WL MMSE equalizer. The method is based on the exploitation of a rhombic transformation that operates on a circularly symmetric constellation making it rotationally variant. Such a transformation depends on two parameters and allows one to control the pseudocorrelation of the obtained constellation; consequently, the optimization procedure is simplified since the SER in (13) is a function of only two parameters, instead of parameters. the decrease of the information amount to be transmitted on the feedback channel; in fact, only the values of two parameters (instead of ) have to be sent to the transmitter. where denotes , denotes − , and denotes + − − − , and where (23) follows from (13) and (19), and the dependence of the disturbance parameters on has been replaced by the dependence on and . Since finding the closed-form expression of and is a difficult problem, here we propose to approximate with a function, say , whose minimization can be carried out by evaluating it only over a very limited set of points. In the sequel, such an approximation is derived for a -QAM constellation , though it can be analogously determined for denser constellations. where is the -curve corresponding to the maximum value of for a fixed (or, equivalently, to the maximum value of for a fixed ). Of course, the restriction to leads to a significant decrease in the computational complexity. Let us point out that, interestingly, such a restricted optimization procedure accounts for the possible transmission of the conventional 4-PAM: in fact, it can be easily verified that when , . Three remarks about the suboptimum procedure (26) follow. The results carried out here with reference to the -QAM constellation can be easily generalized to higher-order constellations. More specifically, the SER-bound approximations (analogous to the one in (24)) can be obtained by assuming that the inner summation in (23) is restricted to those constellation points closest to the th one. Moreover, it can be shown that the conventional square -QAM constellations (with ) can be transformed by (19) into the conventional uniform -PAM. Note, however, that such a property is not satisfied by the constellations of any order; for example, as also shown in Section 4, when using the rectangular -QAM (see Figure 2(g)) the rhombic transformation allows one to obtain the nonuniform -PAM reported in Figure 2(i). Optimum constellations for K=4 and K=8 . (a) QPSK, (b) Rhombic QPSK, (c) 4-PAM, (d) Foschini and All 8-QAM, (e) "1-7" 8-QAM, (f) 8-PAM, (g) rectangular 8-QAM, (h) noncircular 8-QAM, and (i) nonuniform 8-QAM. The optimum transmission strategy proposed here requires that the receiver sends on the feedback channel the whole optimum constellation. If the suboptimum procedure is used, the transmitter architecture can be simplified. In fact, a unique symbol mapper for the alphabet is needed and the constellation is adapted by adjusting the zero-memory WL filter (19). Unfortunately, the main disadvantage in terms of the computational complexity of the receiver remains the adaptation of the decision mechanism for the constellation . It can be easily shown that (a) if , then , unless , and (b) since . Such results show that the minimum-distance decision based on the WL MMSE estimation of outperforms the (computationally simpler) minimum-distance decision based on the WL MMSE estimation of . In this section, we present the results of simulation experiments aimed at assessing the performance improvements achievable by the proposed constellation-optimization procedures. In all the experiments, we assume that ( ) the noise sequence at the output of the channel is zero-mean white Gaussian complex-valued circularly symmetric with variance , that is, ; ( ) the decision delay is optimized; ( ) the SER has been estimated by stopping the simulation after 100 errors occur; ( ) each sample at the output of the WL filter is the input of the decision device that performs the symbol-by-symbol ML detection of the transmitted symbol. In this section, we compare the performances of the constellation design procedures (26) and (14) in terms of SER. In our simulations, we solve (26) by means of an exhaustive search over and : note that in our search we consider , so we consider a finite number of points. On the other hand, we resort to the constrained gradient-based algorithm for solving (14). Since the cost function (13) exhibits local minima, 1000 starting points have been randomly generated according to a uniform distribution. Due to the amount of time required by the computer simulations to determine the solution of (14), we consider, as in , the transmission over a two-tap channel affected by an additive circularly symmetric white Gaussian noise with variance . In our experiments, we have addressed the optimization of the constellation when and for different values of , , and . Let us first plot in Figure 2 some of the optimum constellations obtained during our simulations when solving the optimization problem (14) over the considered channel model; moreover, we plot the suboptimum constellation utilized to implement our suboptimum strategy and the -PAM constellation obtained by applying to it the rhombic transformation. As in , we have found many local optima, some of them were rotated version of the constellations of Figure 2 while others appeared as their rhombic transformation. For the locally optimum constellation set includes the conventional -QAM ( ) and -PAM ( ), as well as the -QAM subject to a rhombic transformation ( ); note that such constellations can be obtained by means of a rhombic transformation of the conventional -QAM (as also shown in Section 3.2), which has been utilized to implement our suboptimum strategy when . For , the optimum constellation set includes the noncircular -QAM found by Foschini et al. ( ), one of the conventional -QAM scheme ( ) called "1-7" 8-QAM , the -PAM ( ) and the noncircular -QAM scheme that we call noncircular 8-QAM. In the following, in order to implement the rhombic-transformation-based constellation-optimization strategy, we resort to the rectangular -QAM; we remember that, unlike -QAM, such a scheme cannot be transformed into the conventional uniform -PAM, but in the nonoptimum nonuniform -PAM (the optimality of uniform PAM over additive white Gaussian noise has been shown in ). In Figure 3, with reference to the case , we have set and we have plotted the SERs achieved by both the suboptimum strategy (26) and the optimum strategy (14) versus , for and for different values of ( ); moreover, for each point of Figure 3, the constellation typically obtained by the optimum procedure is specified by the letter used to denote it in Figure 2. 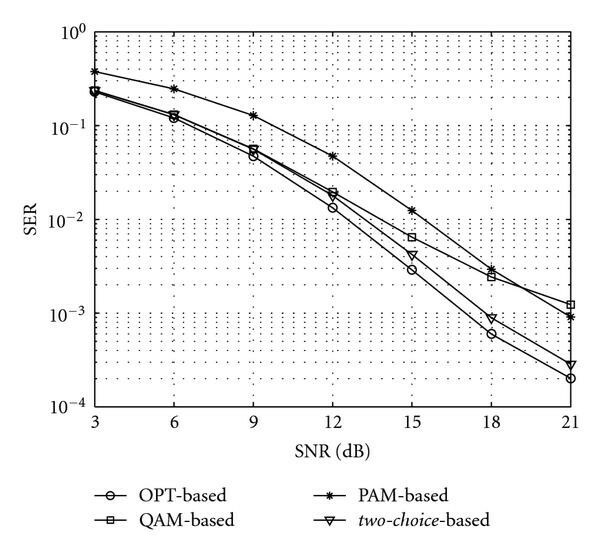 The results show that the two strategies have the same performance: more specifically, both strategies switch to the -PAM when and outperform the conventional nonadaptive transceiver employing the QPSK modulation jointly with the linear MMSE receiver. Note also that as , the chosen value of does not affect the performance. 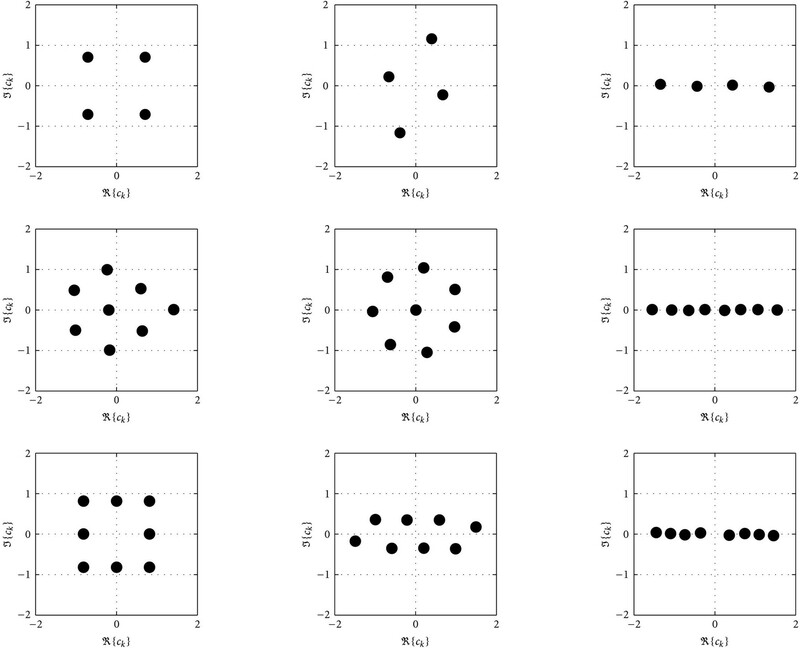 Constellation optimization for K=4 over fixed channel ; for each point, the letter specifies the constellation (of those in Figure 2) typically obtained. In the next experiments, we have addressed the constellation optimization when ; more specifically, in Figures 4 and 5 we have considered the transmission over when and , respectively. 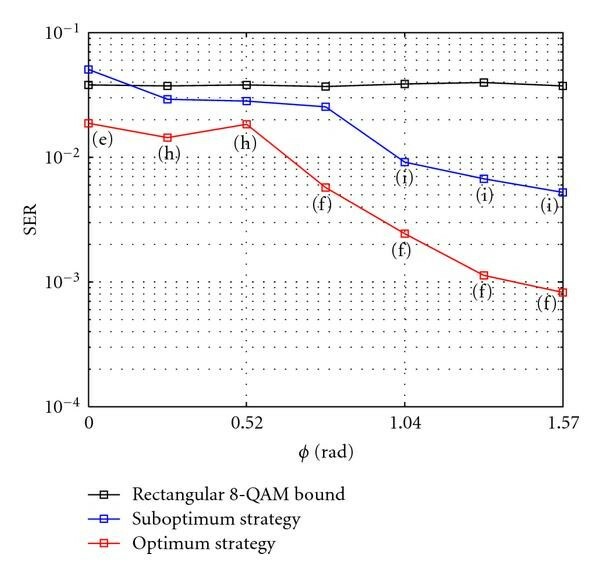 Figure 4 reports the SER achieved by both the suboptimum strategy and the optimum strategy versus for and . The optimum strategy provides performance gain over the non-adaptive transceiver employing the conventional rectangular 8-QAM by using the "1-7" 8-QAM and the noncircular 8-QAM for smaller values of , and, as , by using the 8-PAM. In such a case, the performance difference between the suboptimum strategy and the optimum one is important, especially for large values of , since the suboptimum one employs the non-uniform 8-PAM. Such a result was expected since, when increases, the optimum strategy can exploit a number of degrees of freedom significantly larger than the suboptimum strategy. Constellation optimization for K=8 over fixed channel ; for each point, the letter specifies the constellation (of those in Figure 2) typically obtained. Finally, we observe that, when , an architecture switching between the -QAM and the -PAM can provide a good trade-off between performance and complexity. Instead, when , the transceiver should switch among the Foschini&All, the noncircular -QAM and the -PAM. In the following simulations, we assume that the channel has memory and its taps are randomly generated according to a complex-valued circularly-symmetric zero-mean white Gaussian process with unit variance (i.e., and ); the WL MMSE equalizer has taps; the results have been averaged over 500 independent channel realizations. We compare the performances achieved by four architectures: (I) the OPTimum-based architecture (OPT-based) that selects and in order to minimize the symbol error rate (i.e., , instead of ); (II) the QAM-based architecture adopting the conventional circularly symmetric 4-QAM constellation; (III) the PAM-based architecture utilizing the conventional rotationally variant 4-PAM ( which corresponds to the maximum WL gain); (IV) the two-choice-based architecture that switches between the 4-QAM and the 4-PAM constellations according to (27). For clarity, we point out that the solution of (26) loses about 0.3 in comparison with the OPT-based one; we consider the OPT-based architecture in order to provide a lower bound to the SER. The OPT-based and the two-choice-based architectures, unlike the QAM-based and the PAM-based ones, require the existence of a feedback channel between the receiver and the transmitter for constellation adaptation; however, the two-choice-based architecture only needs to transmit a binary information on such feedback channel. In Figure 6, the SERs of the considered architectures are plotted versus the (in dB). The OPT-based architecture outperforms all the others and provides an SNR-gain over the nonoptimized architectures of almost for a . Interestingly, the two-choice-based architecture performs well loosing only in comparison with the OPT-based one. Let us also note that the PAM-based architecture performs poorly for low , but, as the increases, it outperforms the QAM-based one. SER of the considered architectures versus SNR. In the next experiment, we compare the considered architectures by evaluating their capability to guarantee the required quality of service (QoS). More specifically, in Table 1, we report the percentages of the channels over which the SNR required to achieve the target SER (assumed to be , , ) is not larger than 21 . Moreover, Figure 7 reports the probability, say , that each architecture loses in comparison with the OPT-based one for a given target SER under the condition that the SNR is not larger than 21 . Percentage of channels over which the target SER is achieved. 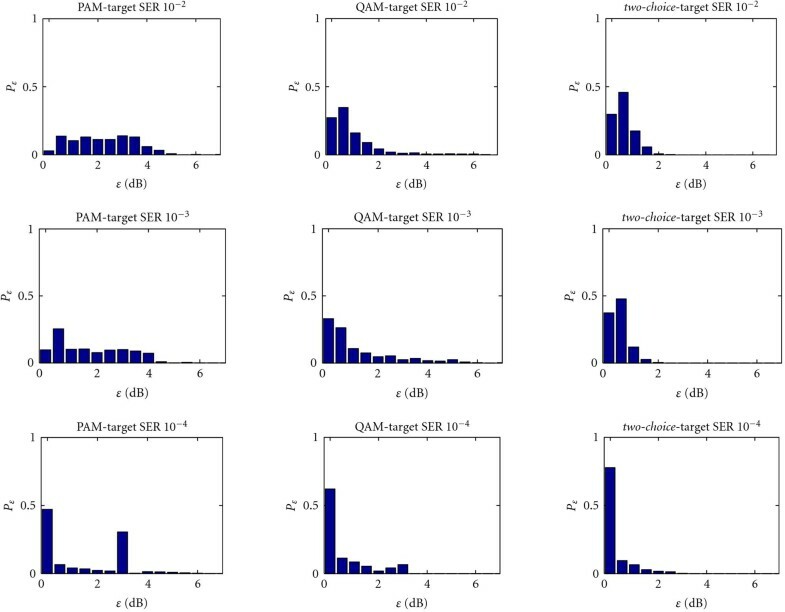 Loss in dB of the PAM-based, QAM-based, and two-choice -based architectures with respect to the OPT-based one for several target SER. The PAM-based architecture is robust with respect to the communication environment since it often achieves the target SER. This is mainly due to the improved capabilities of the WL equalizer when the transmitted and the received signals are rotationally variant. However, it requires a larger in comparison with the OPT-based architecture to compensate for the reduction of the dimension of the signal space. Note also that such an SNR loss, which is uniformly distributed between 0  and 4  when the target SER is and , assumes often two specific values (0  and 3  ) for a target SER equal to . In practice, the PAM architecture achieves optimum performance on 50 of the channels where the linear equalizer performs unsatisfactorily and the WL processing gain, specific to rotationally variant constellations, compensates for the smaller minimum-distance of the PAM constellation. The QAM-based architecture is not robust with respect to the communication environment. When it is able to achieve the target SER, it requires a limited amount of excess SNR over the OPT-based architecture; nevertheless, it is unable to achieve the target SER of on 37 of the channels. This is due to the circular symmetry of the constellation that does not allow one to improve by means of the WL processing the unsatisfactory performance of the linear equalizer. The two-choice-based architecture is particularly simple and robust since it combines the advantages of both PAM and QAM constellations. We have addressed the problem of constellation optimization for the WL MMSE equalizer. By modeling the residual disturbance at the output of the WL equalizer as a white Gaussian (possibly rotationally variant) process, we have singled out constellation-design methods which minimize an upper bound of the symbol error rate. The first method exploits all the degrees of freedom ( ) associated to the -order constellation exhibiting, therefore, an unaffordable computational complexity for high-order constellations. To overcome such a problem, a second design method based on a rhombic transformation of a fixed alphabet of order is proposed. It performs the optimization of only two parameters (instead of ) leading to a huge reduction of the computational complexity for large . For low-order constellations, the simulation results show that the two techniques are practically equivalent in terms of symbol error rate; moreover, they also show that a WL MMSE transceiver with constellation adaptation is clearly superior to the same equalizer with fixed constellation. Finally, for , it has been shown that the method that switches between a real-valued and a complex-valued constellation exhibits a limited performance loss versus the optimum adaptation scheme, while it achieves a strong reduction of the computational complexity and it requires to feed back to the transmitter only a binary information.